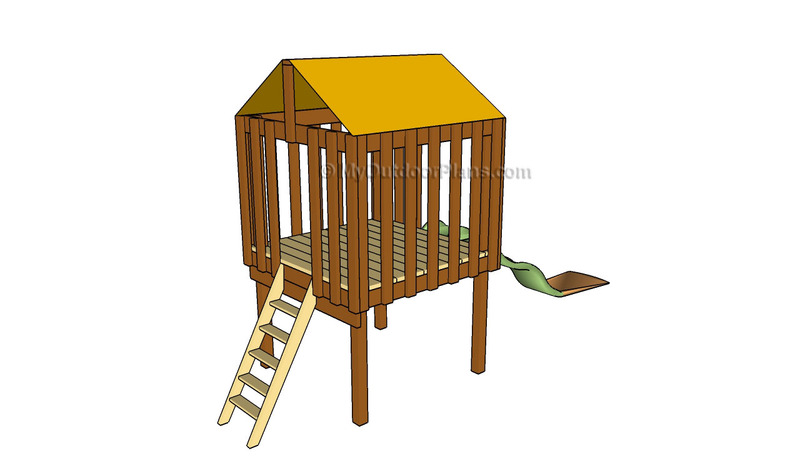 This step by step diy woodworking project is about tree fort plans. 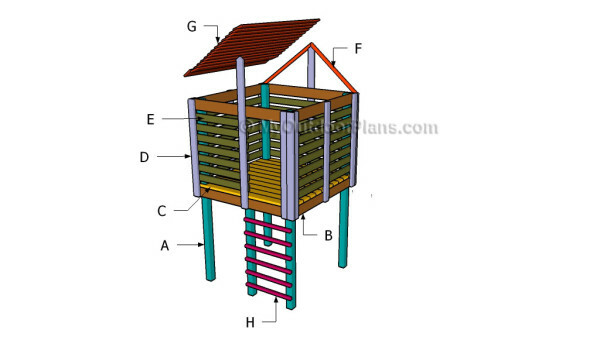 If you want to surprise your kids with a great gift, we recommend you to build a wooden tree fort. As you will see in the detailed instructions, any person with average woodworking skills can get the job done in a weekend, provided quality materials and professional tools are used. 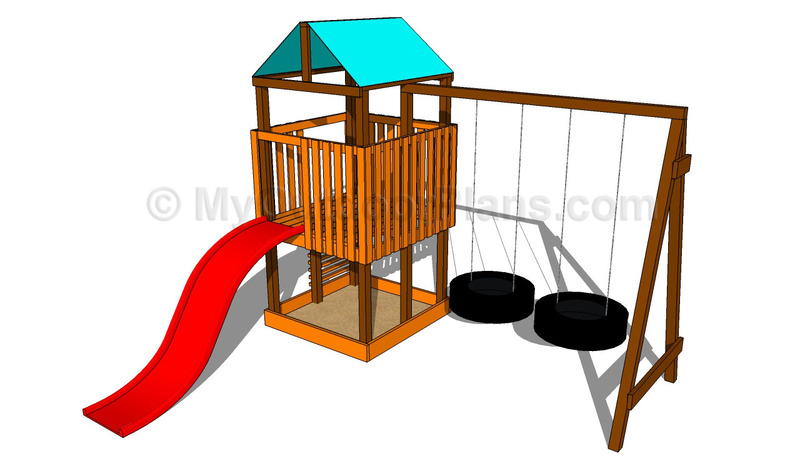 Choose a proper location for the kids fort and make sure the joints are rigid. Make sure you smooth the exposed sharp edges by using a router or a sander. There are many fort plans you can choose from, so make sure you take a look over the alternatives before starting the actual construction project. 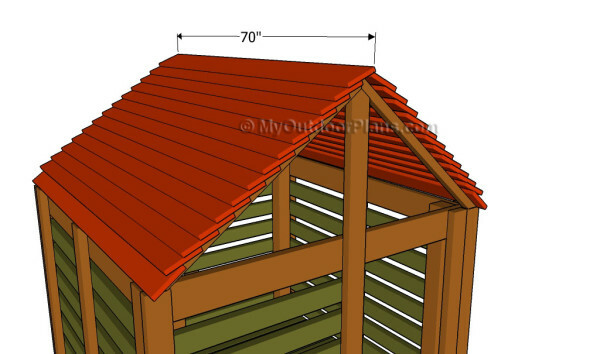 Invest in high quality and weather resistant lumber, such as cedar, pine or redwood. Always take accurate measurements and use a professional saw when building the components, in order to get the job done properly from the very beginning. 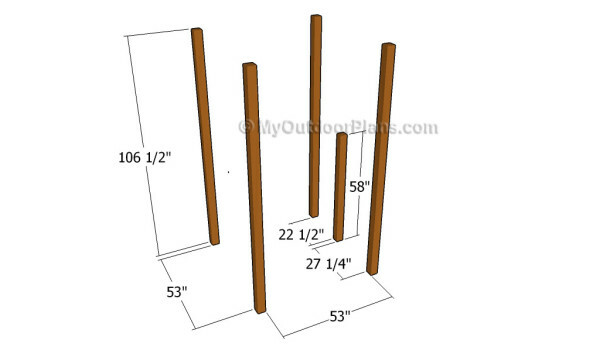 The first step of the woodworking project is to lay out the tree fort and to set the posts into place properly. In order to get the job done in a professional manner, we recommend you to use batter boards and string when laying out the posts. Make sure the corners are square. Dig 2-3′ deep holes and fit tube forms, before pouring the concrete. 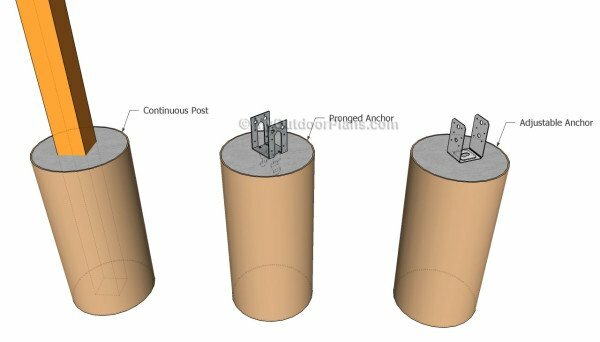 Set the posts into concrete or use post anchors. Check if the posts are plumb. 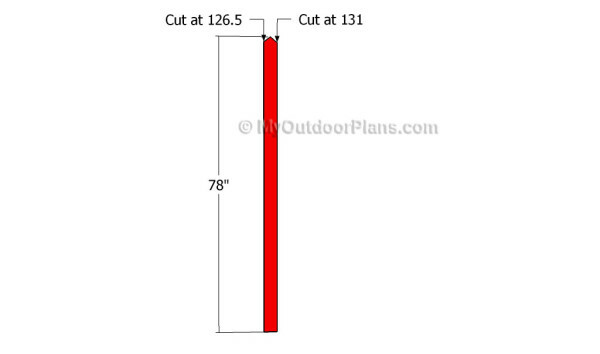 As you can easily notice in the diagram, we recommend you to cut the posts out of 4×4 lumber. 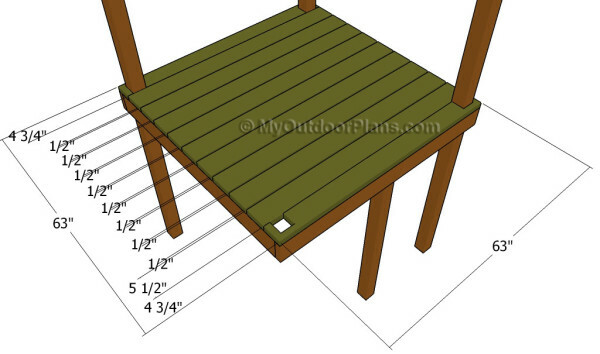 Take accurate measurements and place the posts as described in the image. Make sure the posts are perfectly straight and in a very good condition. Use a spirit level to make make sure the posts are plumb. 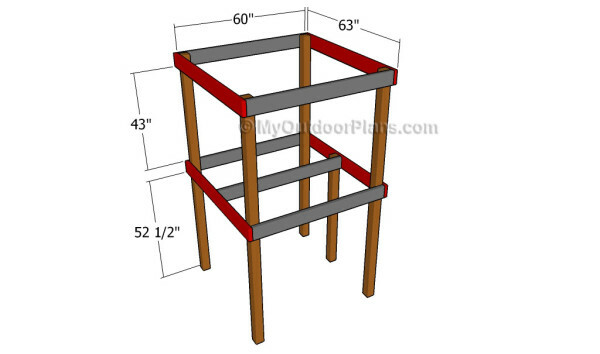 Continue the project by attaching the 2×6 joists to the wooden posts. In order to get a professional result, we recommend you to clamp the joists to the posts, after making sure they are perfectly horizontal. Drill pilot holes through the joists and insert 2 1/2″ lag screws into the posts. Leave no gaps between the components and double check if the joints are rigid enough. Attach the 2×6 floor slats to the joists, making sure you place them equally-spaced. 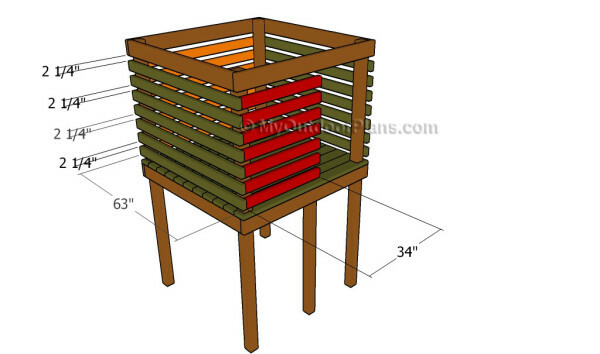 In this manner, the water will be drained properly and the wooden components will not be exposed to moisture. Make appropriate notches around the posts in order to get a professional result. Pre-drill the wooden boards and secure them to the joists using 2 1/2″ screws. Smooth the cut edges with sandpaper and remove the residues with a damp cloth. 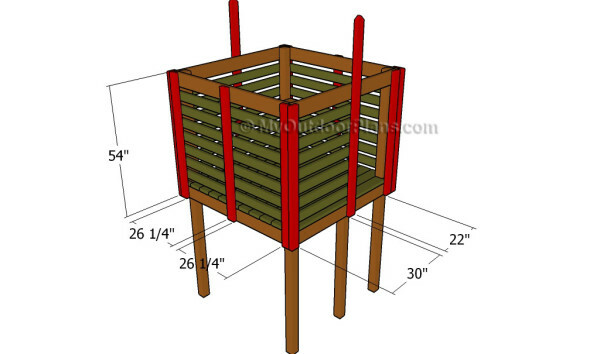 Attaching the 2×2 steps to the ladder of the fort is a straight-forward process. If you want to get the job done in a professional manner, we recommend you to cut the steps at the right size and to drill pilot holes before securing them to the posts with 2 1/2″ screws. Place the steps equally-spaced and make sure the corners are square. 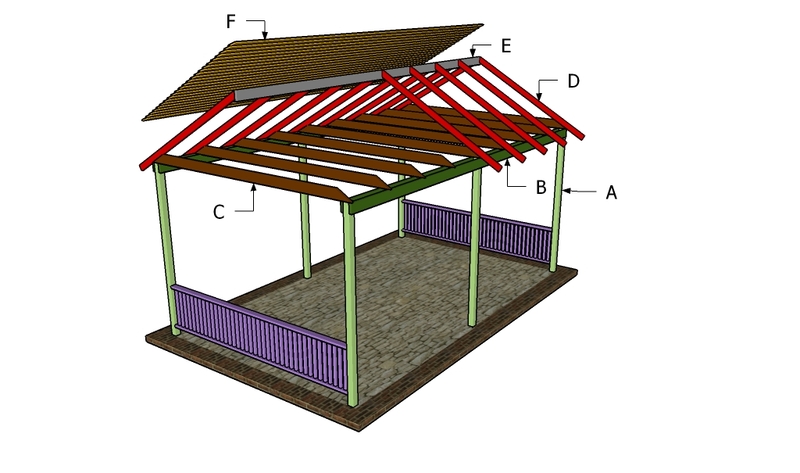 Continue the backyard for project by attaching the 2×4 guard rails to the structure. 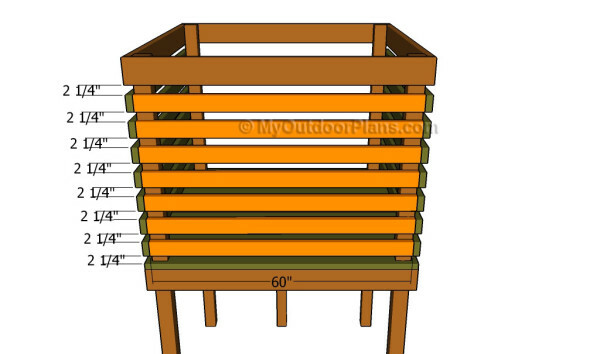 As you can easily notice in the plans, we recommend you to place the slats equally-spaced and to lock them to the posts properly. Top Tip: Leave no gaps between the slats and secure them to the posts using 2 1/2″ screws. Drill pilot holes to prevent the wood from splitting. Next, attach the components to the sides and to the front face of the tree fort. In order to get a professional result, we recommend you to place the slats equally-spaced and to drill pilot holes before securing them to the posts using 2 1/2″ screws. Add glue to the joints and remove excess using a damp cloth. 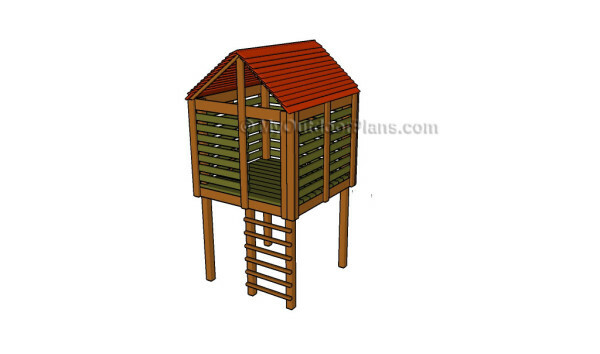 In order to increase the rigidity of the structure and to enhance the look of the tree fort, we recommend you to fit the 2×4 trims to the corners of the backyard construction. Leave no gaps between the components and secure them to the guard rails by inserting 2 1/2″ screws, after drilling pilot holes. Building the roof supports is a simple task. You need to take accurate measurements and to cut the top of the supports at the right angle, otherwise the rafters won’t fit into place. Work with attention and use a miter saw to get a professional result. Next, cut both ends of the rafters at the right angle. by using a circular saw. 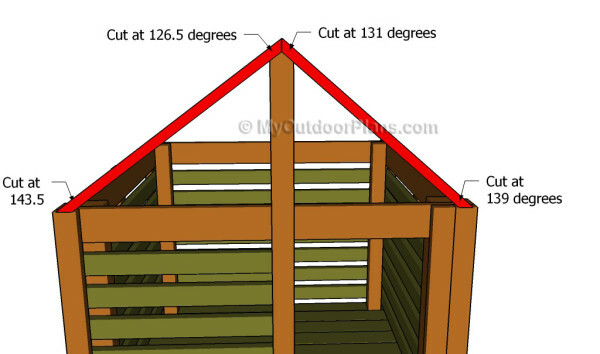 Smooth the cut edges with sandpaper and fit them to the structure, as described in the diagram. Top tip: Drill pilot holes through the rafters, align them at both ends and secure them into place by using 1 1/4″ screws. One of the last steps of the woodworking project is to attach the 1×6 roofing slats. 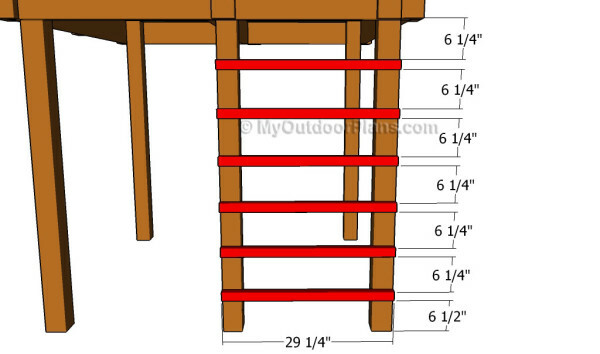 In order to get the job done in a professional manner, we recommend you to cut the slats the the right size and to secure them to the rafters by using 1 1/4″ finishing nails. Align the slats at both ends and drill pilot holes before inserting the nails, to prevent the wood from splitting. Make sure the next upper slats cover the head of the screws, to protect them from water damage. Top Tip: Apply several coats of stain or paint to the components, in order to protect them from decay. Choose vivid colors in order to create a nice appearance. This woodworking project was about tree fort plans. If you want to see more outdoor plans, we recommend you to check out the rest of our step by step projects. Could you point me to where I can see/find how many and what size screws, nails, braces, etc…? All I see are the wood specifications. I’ve updated the building list to include the screws and other items needed for the project. Good luck with your diy projects!